I have spent a needless amount of time thinking about my van, just as a general statement. My previous two vans were tin-tops, i.e. no pop-top. So the idea of a high top conversion was always on my radar. Well, I now have an ASI Riviera, which has the vertical type pop-top, as opposed to the angled Westfalia version. The upside is that it has a low profile when not in use, and then simply push it up when parked and you can stand, and sleep, up top. The downsides are that with the top popped any interior heat is quickly lost, and everyone knows you’re inside – should you be trying to stealth camp. A few months ago I received word that a guy in Canada was making a handful of Get Away van reproductions. While my favorite top is the Adventurewagon top, no one seems to making them currently. The Get Away top is pretty cool though, and probably my second favorite design wise. Time passes quickly, and before my indecision knew it, the tops were sold off. I would then go on to find out that a few of them had been purchased by someone in the Portland area – my city! Last week I found out whom, and this week I ran over and checked them out. They are sooooo cool, but also very tall. Generally speaking, I think vans with high-tops look cool, cooler than their pop-top counterparts. So, now I am left in a bit of a crossroads. These tops are $2,500, which is a bargain compared to the others on the market, but 2.5k none the less. Once I pay for epoxy, insulation, custom rack for solar panels, and finishing out the inside, I’ll easily be in over 3k. Which is not unreasonable given the functionality of this modification…. but…. if I am willing to part with $3,000 on van modifications, what could/would I do? Turns out, you can do a fair amount with $3k. All the below still leaves me with about $380 to play with. But… while it may seem like the decision is simple, I really like the idea of being able to just stand inside the van and to be able to have an insulated standing area, rather than having to keep the top down in cold weather. Ugh, this shouldn’t be so hard. Someone, and with good reason, asked how the rest of the van was doing since this decision is fairly non-mechanical. This van has had a lot of work the past year or so. New transmission, new brakes and master cylinder, Schwenk springs and new shocks, 15″ wheels with meaty BFG KO tires, new radiator and waterpump, and the list goes on. So all in all, great condition. I have exactly the same dilemma – and I have decided to go for it. Although before buying a new one, I will try my best to source a recycled hightop (but those are really hard to find). To me a van is not really a VAN unless it has a hightop – so getting one somehow is essential. I would have loved to find a used one, but as you said, they are few and far between. I about a year ago was going to high top my van, had the top and everything. But after thinking about what we wanted to do both trips and van goals we came to the conclusion to hold off. At the end of the day its a lot of money, the top its self, glue, insulation, windows, bulk heads, the list can go on and on. That kind of money can go a long way in other parts and for trips too. We also knew that there would be more batches of high tops getting made and also with time the options. Two years ago you could only really get your hands on the AW or NAHT top. But now there are at least 4 out there easy to find, the others being Getaway and Reimo both of which are in B.C. So we sold the top and started to focus in on getting everything else dialed and fine tuned on the van. Going high top will be the last move if we end up going down that path again. 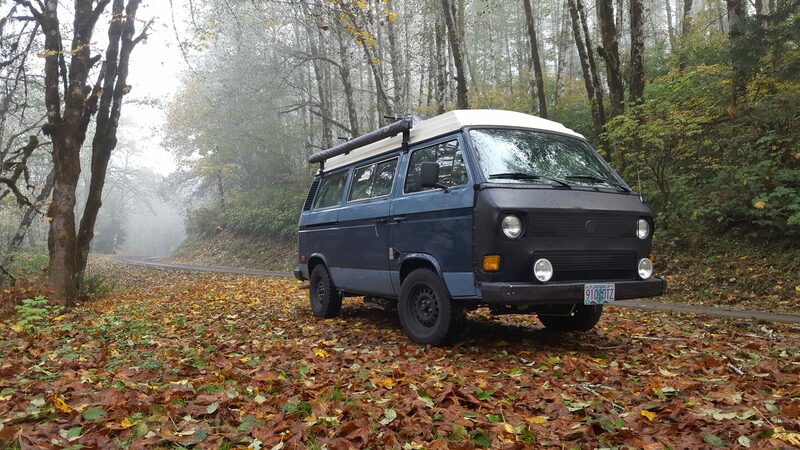 What are the trips and van goals that made you decide against the hightop? Some folks I met down in GoWesty’s parking lot in 2017 (https://www.instagram.com/live.travel.play/) made a good point in respect to the decision – the hightop won’t fit in a shipping container. Will I ship my van overseas someday, I can only hope/dream.